The beautiful 11 x 15 inch watercolor painting by John Schoenherr, used for the ACE paperback first edition of Dune, just sold for a little over $26,000 at Heritage Auction Galleries, shattering the $10,000 to $15,000 pre-auction estimate. Internet bidders pushed the price to just over $19,000 prior to the live segment of the auction, which saw the bidding for the painting reach $26,290. The painting was also used for the 25th Anniversary paperback edition of the Frank Herbert classic that created an enduring sci-fi universe. So what makes this painting so special? 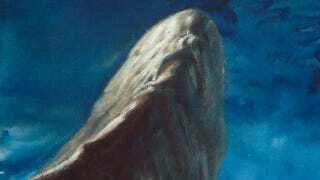 John Schoenherr was no stranger to the Dune Universe, as he painted the cover that adorned the first hardcover edition of Dune and also contributed paintings for Dune World serials published in Analog, including the classic depiction of a Sandworm that adorned the March 1965 Analog cover for the Prophet of Dune serial. Schoenherr, thanks to world of the internet, is also well known for creating the image that served as the prototype for Chewbacca. His cover for July 1975 issue of Analog featured a wookie-like creature advertising the George R.R. Martin short story And Seven Times Never Kill Man!. The story itself is accompanied by several ink drawings by Scoenherr, that when shown side by side with later Ralph McQuarrie concept art for Chewbacca, further implicates Lucas and associates. Did George R.R. Martin create Wookiees? Does it belong in a museum? So, you might not have an original Dune cover painting around the house, but the first hardcover edition routinely sells for several thousand dollars, well worth scurrying through a nerdy relative's attic to find. If this watercolor landscape of the sands of Dune sold for $26k, how much would the art for Schoenherr's Sandworm laden Analog cover be worth? And, to paraphrase Indiana Jones, do pieces of modern science fiction and literature art like this belong in museums and not the domiciles of collectors? Whatever your answer is, I know I'd rather have this painting than a new Audi.